The morphology, composition, and distribution of key microstructural features of many engineering materials influence their properties. Although conventional optical microscopy can be used to observe these features, a scanning electron microscope (SEM) is ideal in cases requiring higher magnification and 3D detail. 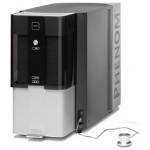 The Phenom™ desktop SEM has a higher resolution of 30nm compared to the resolution limit of optical microscopes of 200nm. It is economical, rapid, and convenient to operate when compared to a conventional SEM. The Phenom can be used to perform rapid analysis of common engineering alloys in areas, including research studies, failure analysis, quality control, and routine metallurgical analysis. Metallography provides data about alloys relating their composition and processing to their properties and performance. For instance, the yield strength of titanium alloys has been related to the thickness of the α-laths. Accurate measurement of the α -laths provides key input for emerging models that can deduce alloy properties. The α-laths (darker phase) as well as the β-ribs (lighter phase) between the laths of β-processed Ti-6-4 are delineated in Figure 1. The average thickness of these laths can be calculated using proven measuring methods with an uncertainty of roughly 50-100nm, which is lower than the resolution limit of traditional optical microscopes of 200nm. Figure 2 shows sub-micron sized α-laths formed in titanium alloys due to a second nucleation event. This phenomenon can often reinforce the alloy. Conventional optical microscopes find it difficult to image such fine features, or even to confirm their existence. The Phenom™ desktop SEM can readily observe these features. Figures 3 and 4 depict additional microstructural features of a cast aluminum alloy, revealing the impact of shrinkage porosity and size and distribution of the intermetallic phases (lighter phases) on the alloy properties. Figure 3 demonstrates the ability of the Phenom to acquire topological data such as shrinkage porosity details owing to its intrinsic depth of focus as well as the simultaneous acquisition of data on the distribution of phases within the microstructure represented by contrast variations in the image. Figures 5 and 6 illustrate Ni-based superalloys, which are advanced alloys and the product of decades of intense research. The alloy is composed of a disordered gamma matrix and ordered gamma-prime, providing it a unique combination of strength and creep resistance. This very attractive combination makes it a suitable material for certain regions of gas turbine engines, for instance jet engine. Al typically contains high level of gamma prime, represented in a darker shade in BSE mode as illustrated in Figure 6.